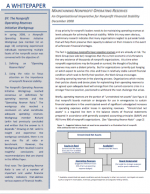 An all-volunteer national advocacy effort to increase financial sustainability among nonprofits through building and maintaining operating reserve funds. To define, promote, and facilitate the practice of building and maintaining operating reserves throughout the nonprofit sector as a key strategy toward ensuring the long-term sustainability of the organizations and programs that save and enhance our lives. 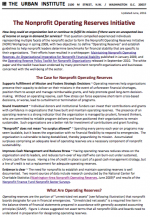 All nonprofits have a well-managed operating reserve in place in an amount appropriate to each organization’s specific needs. 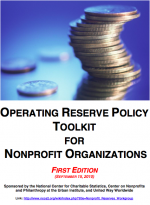 Building and maintaining operating reserves is universally understood as sound policy and endorsed by nonprofit organizations’ staff and board leaders, the donors and funders who support them, and the accounting professionals who serve them. We invite you to contact us if you have questions about developing your policy, or if you would like to be notified of any additional documents, tools, examples that are posted, or if you would like to share your organization’s reserve policy.